Following the incredible success and reception of ‘The Mahogany Murders’ in The Companion Chronicles range that re-introduced Doctor Who fans to Henry Gordon Jago and Professor George Litefoot from the Fourth Doctor tale ‘The Talons of Weng-Chiang,’ the debonair double act now makes its presence known in The Fourth Doctor Adventures range. With a seeming supernatural vigilante known as The Pugilist stalking the Victorian London criminal underclass as a series of corpses is turning up around the city, the infernal investigators soon find themselves out of their depth. The central premise of the story is an oft-used but reliable one as an individual discovers and attempts to use alien technology only to soon lose control of the semblance of power attained. Indeed, the overcoat-clad steam-driven creation- as incredibly effectively depicted audibly in the story and visually on the cover- is unquestionably one of Big Finish’s greater successes, and the mind-reading Justician upholding the laws of whichever planet it finds itself on, in the process putting all of Earth in jeopardy as it tries to decipher what constitutes a true crime, is fantastic. Although the concepts in play have been used before, the superb atmosphere and performances from all involved make ‘The Justice of Jalxar’ something altogether more special. Naturally the Doctor and Romana are the more intelligent pairing and thus reduce Jago and Litefoot to something more akin to a supporting role, but Christopher Benjamin and Trevor Baxter still have ample opportunity to shine as their exuberant personalities and eagerness refuse to be outshone. Mary Tamm does admirable work as Romana as well, and writer John Dorney proves he has a firm grasp on the more aristocratic character as she handles exposition duty when the Doctor falters; she seems amused as she becomes the victim of a common mugging and then attempts to psychoanalyze the villain before all is said and done. Tom Baker is, as usual, absolutely spectacular and seems to be relishing the opportunity to reunite with Benjamin and Baxter in a story that could easily slide into the Philip Hinchcliffe era of the programme. ‘The Justice of Jalxar’ wisely avoids trying to be a sequel to ‘The Talons of Weng-Chiang,’ giving a greater degree of surprise and flexibility within the allotted running time while still allowing for the requisite sense of nostalgia. With an excellent pacing that flies from exposition to resolution and denouement, the visual and atmospheric story alone makes this a worthy addition to The Fourth Doctor Adventures. 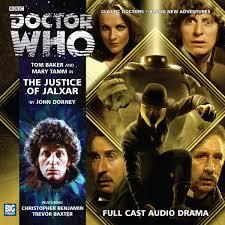 However, with the superb characterization of the Doctor, Romana, Jago, and Litefoot alongside a nuanced villain and an intriguing if oft-used central concept, ‘The Justice of Jalxar’ truly excels on all fronts. There is one brief scene in which the Doctor is able to draw the Justician away from others due to the immense guilt he always carries around with him as a result of individuals he has not managed to save during his many adventures, one that could have been fleshed out for immense dramatic effect and exploration of the titular hero, but that one subjective missed opportunity aside, John Dorney has managed to craft another stellar entry for the Tom Baker audio library.